The Gatesville ISD Education Foundation was formed in 2012 to support innovative classroom teaching, to inspire learning in new directions, and to maximize academic opportunities for Gatesville ISD students. Enhance and enrich educational opportunities for students. Support and recognize staff for for innovative efforts and exemplary teaching. Build community awareness for Gatesville Education Foundation. Involve the community in assuring a quality education for the leaders and workers of tomorrow. The Gatesville ISD Education Foundation is now a 501(c)(3) organization! 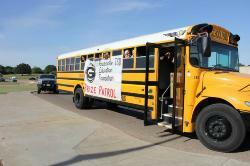 Your donations to the GISD EF are considered a charitable donation.